Dear friends, with the year coming to an end and me still not having had the time to sit down and write some new, well-thought out posts, I decided to republish this piece from last December, because it mirrors what we have been drinking a lot here in Alaska: Lambics. It was also the first article on beer that I posted here…so it does have nostalgic value. Wishing you a great New Year’s Eve and, as we say in German, a “good slide into 2014”! See you next year. Now, this is the second time I am celebrating Christmas with my wife’s family in Alaska. It is breathtakingly gorgeous and about as Christmassy as it gets: tons of snow, lots of darkness (aka tons of sleep), and crisp and clean air. Everything is very relaxed with my in laws which I also appreciate. One of the Christmas traditions is to have lambics, because my mother in law loves them. They are a type of Belgian fruit beers. The brand we get, because it is readily available, is from Lindemans Brewery in Vlezenbeek, Belgium which has been around since 1811. Lambics are produced with spontaneous fermentation, that means unlike other beers they use the yeasts that naturally are dispersed in the air instead of cultured yeasts. Lindemans ferments the beer, then adds the fruit and starts a second fermentation. The resulting beers remind me way more of a cider than a beer (which is good for me). If you want to know more, their U.S. importers have a pretty decent website (here). 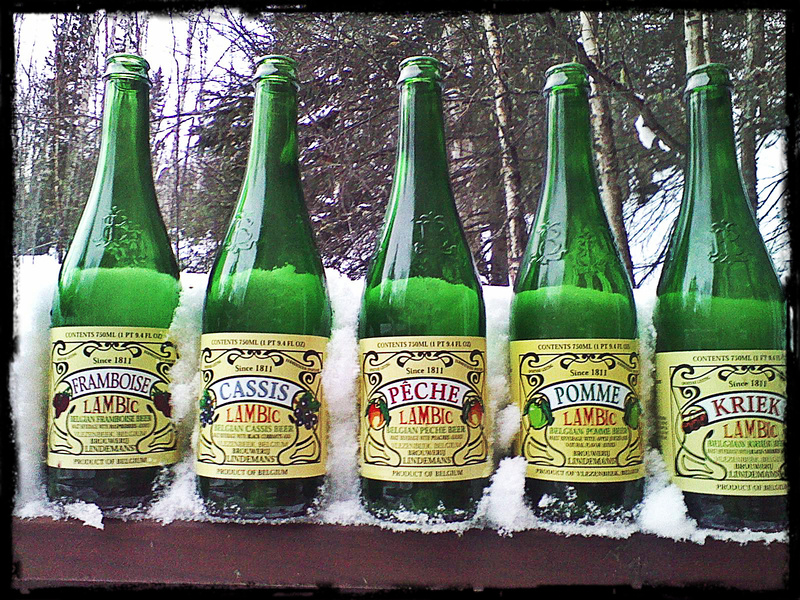 This year, we were able to have a veritable cross-tasting because we had acquired 750ml bottles of framboise (raspberry), cassis (black currant), pomme (apple), pêche (peach) and kriek (sour cherries). Up until Christmas Day, I only ever had raspberry and loved it. The framboise lambic was as good as ever: Nicely acidic, full of that wonderfully tart raspberry aroma that I like so much. The cassis was stunning: It really smelled as intense as the cassis liqueur that you add to sparkling wine or still white wine to make kir royal or kir. It had a wonderfully strong blackcurrant aroma which was topped by the refreshing maltiness of the beer. The pomme was very similar to a cider, although a bit more acidic than the ciders I prefer. It was quite sour actually, but still refreshing. Not in the top for me. I would prefer a cider over this one. The pêche was the most interesting for me. I am not a big fan of peaches, they tend to be too sweet for my taste without redeeming acidity. But, as you may guess from my previous notes on lambics, in this beer it worked because there was a healthy amount of acidity. The peach aromas balanced that nicely and were never overbearing. Decent lambic. The kriek is problematic for me because I don’t like cherries very much. I just had a sip of it, and it was ok. If you like cherries, like pretty much everyone, you would most likely be quite happy with this one. My in laws definitely were. Great post! I’ve only had raspberry and kriek, so I’ve got come catching up to do! How beautiful a snowy Alaska sounds! I really like it up there! I may have to try one of these, but my family is from Canada, and all of my relatives believed the words on the billboards around town that read “Drink Canada Dry,” which is a ginger ale, but they read it with a comma after Canada. Molson Canadien and Johnny Labatt’s Cream Porter were the two that always stayed with me. Now sipping Bourbon is another story. I do hope that you and Nina are enjoying your stay in Alaska and I am sure, that we all understand that you are having too much fun to write an article. love the photos! i only wish we would get that much snow. HNY! Yes, the framboise is the most common here. A lot of the stores only have that one. Glad you enjoyed it, too! Thanks for featuring these beers. My partner and I love this type of beer. I’m going to find out where to get it here in Seattle. Thank you for stopping by! And good luck finding them, it shouldn’t be a big deal in Seattle to unearth them. Let me know what you think!! Thanks, Anatoli! I hope you won’t regret it…let me know how it goes. 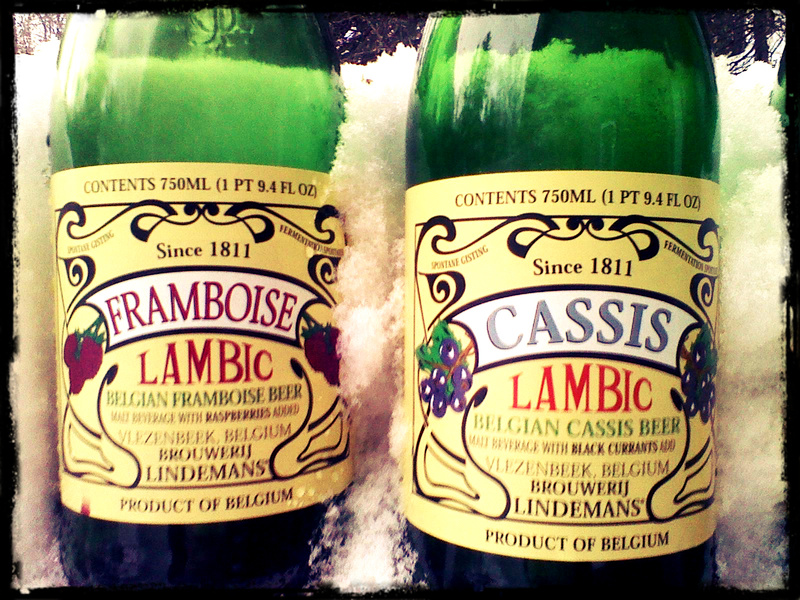 I love the Lambics – there are a couple of grocery stores that carry them here, and one pub. Framboise is my favorite also, but the peche is decent too. I might have to see if I can find the Cassis; I’ve never had that one. I really was intrigued by the cassis. So aromatic. The peche is good, too! It was the first time for me to see the cassis when I got here. 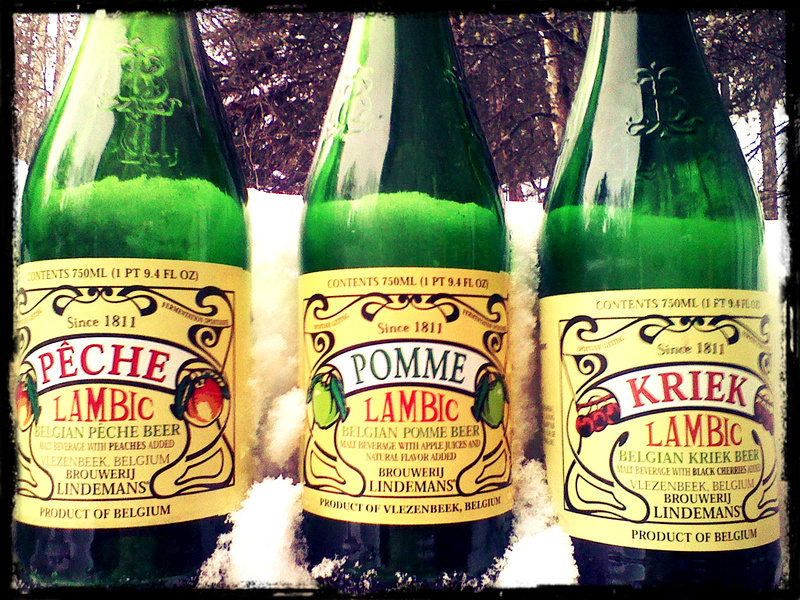 Nice post–like the hedonist, I am a fan of the lambics when it comes to beer…. Thanks! They sure are my favorite type of beer. Lately I’ve been choosing beer over wine when pairing at restaurants, especially with spicy foods. Lambics are probably my favorite kind of beer. I know a lot of people find the sour and the funky aromas off-putting, but I think they are very refreshing. I’m cool with IPAs, but it took some time to appreciate them. I’m still not a big fan of porters and stouts. How are you with spirits – bourbon, scotch, tequila, etc? 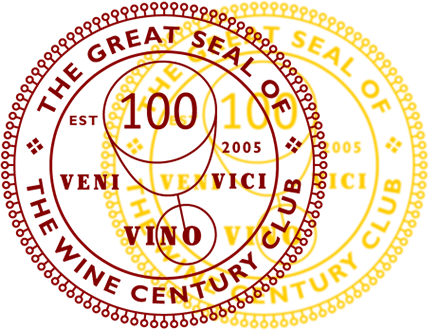 I’m thinking about having a tasting for a future post… Let me know! I agree that the lambics have this quirky interesting mix of sour and aromas. I am totally into bourbon and gin when it comes to hard liquors and would love to join a tasting. Just keep me posted! I’ve never see these type of beers here in Munich. Sounds quite interesting though. All they sell here are lager (Helles), pilsner, weißbier and a few other types of traditional German beer. I usually stick to wine though..
We usually bought it in Luxembourg because we also couldn’t find it in Germany. German culture is just so against these fruit beers. And then the Berliners make Weisse mit Schuss, which is so much worse….give them a try, though, if you can. I see what you mean, Tracy, but I really encourage you to try one of them. They don’t taste artificial at all to me. But those memories you have, ugh. I’ll make sure I’ll have some around when we will see each other…whenever that will be.